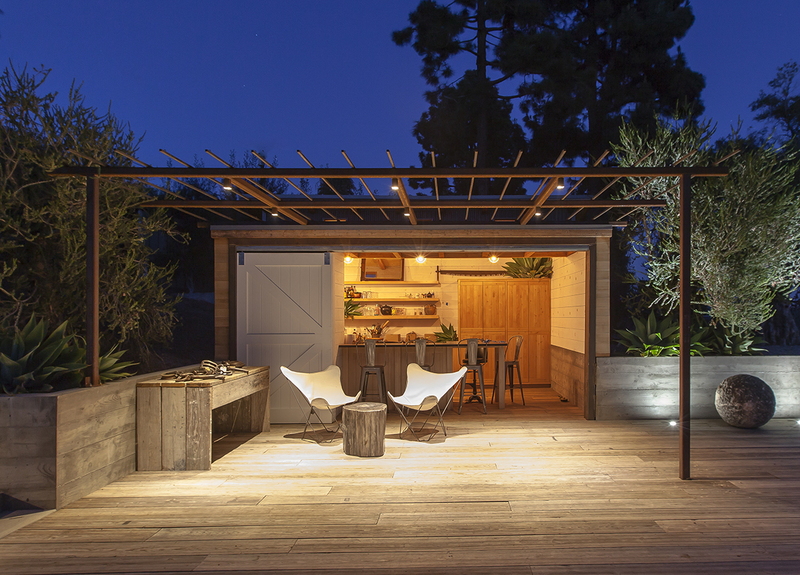 Honored to have been recognized by AIA Santa Barbara for a 2015 Design Awards Merit Award in the Small Projects category for our Somis Poolhouse, part of our larger Somis Exterior Site project. The project also received certificates of recognition from County of Santa Barbara’s first district supervisor Salud Carbajal, California state senator Hannah Beth Jackson, and state assembly member Das Williams. Design rationale and additional project images below. Thanks as always to Kurt Jordan of Kurt Jordan Photography for making us look so good. For a full list of winners in all categories visit the AIASB awards page here. 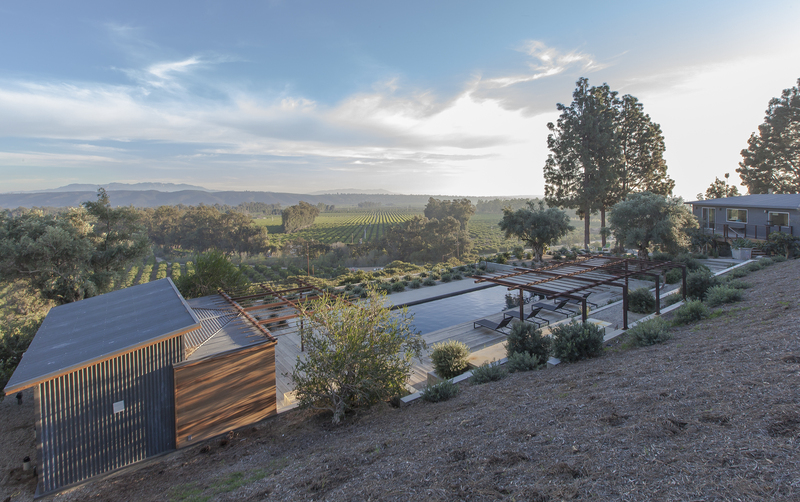 This modern-farm-style pool house, part of a larger site redesign, overlooks a rich agricultural valley with sweeping views that extend to the Pacific Ocean. 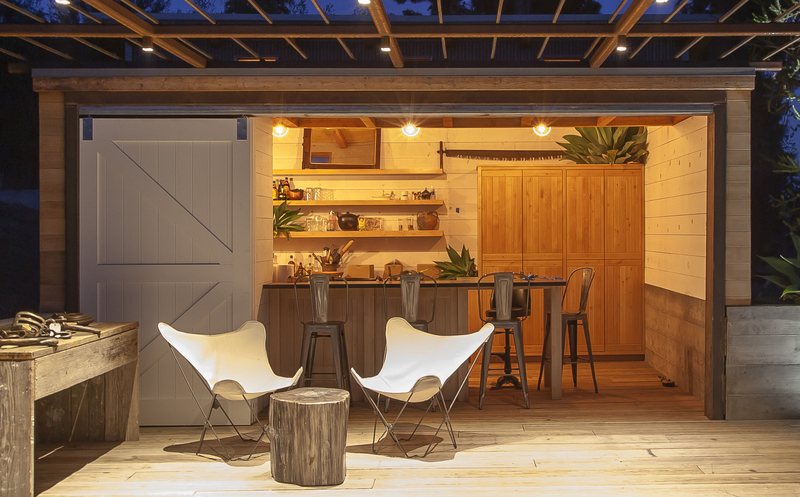 Created for a farm-to-table restaurant developer, we built a rural retreat that has minimal impact on the land that supplies her customers’ meals. The significant slope and questionable stability of the original site presented practical design challenges. To address these, the hillside was over-excavated and re-compacted, providing necessary support for the pool house as well as the adjacent pool and tiered terraces. The overall design has a considered geometry meant to celebrate the fields it borders. The sharp angles and linear patterns of the structure and site both echo and frame the rows of agricultural plantings below. Building materials are equal parts utilitarian and sustainable. 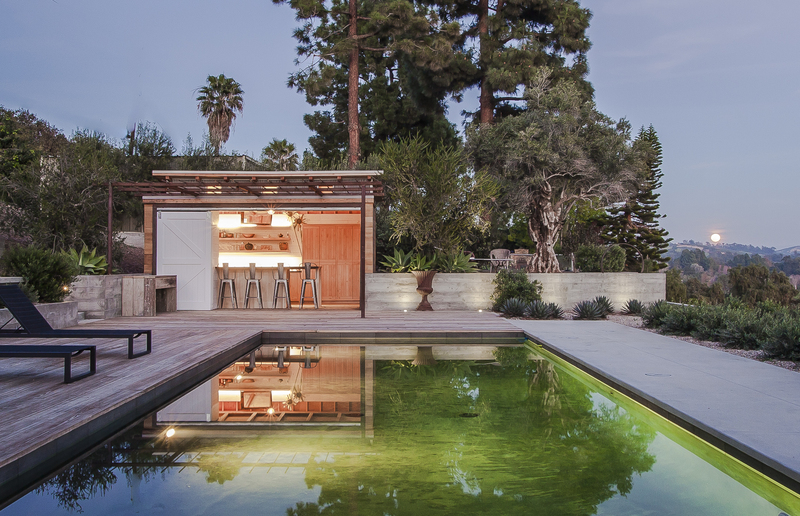 Intended to grow increasingly inconspicuous with age, the reclaimed wood plank flooring, reclaimed steel trellis, high fire-rated cedar siding, corrugated steel panels, and board-formed concrete retaining walls are also in keeping with the owner’s own working-ranch aesthetic. The house’s placement – snugged against the xeriscaped slope and fronted by a cluster of century-old, field-dug olives – further minimizes visual impact on those working the surrounding lands. It also enhances the structure’s energy efficiency: the slope provides natural thermal regulation, the olives shade. Once planted, the trellis will also shield the sun, while prevailing westerly winds add passive cooling as they pass over the length of the rectangular pool and through clerestory windows.